There's nothing like the sight of a hog enjoying rich tasty soil. 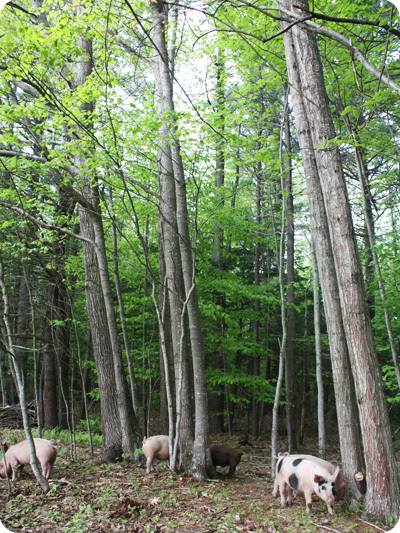 We rotate our pigs along a wooded pasture border so that they benifit from the woods and enjoy the grubs, roots, and acorns that abound there. 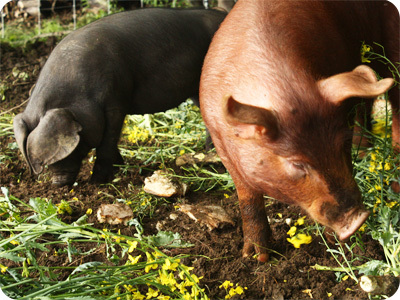 Since we don't breed our own piglets anymore, our pigs are not certified Organic, but we meet or exceed all the Organic standards for how we manage and feed them. As of 2019, we are no longer offering whole or half pigs - sorry! 1. You sign up for a whole or half hog using our Order Form. 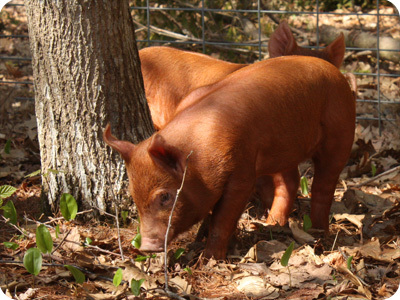 It is a $50 deposit to reserve a half hog and $100 to reserve a whole hog. 2. We contact you to confirm and to let you know the next available butcher date. 3. You fill out and send us a pig cut sheet. This specifies how you'd like your half or whole pig cut up and what, if anything, you'd like smoked (for additional cost). 4. 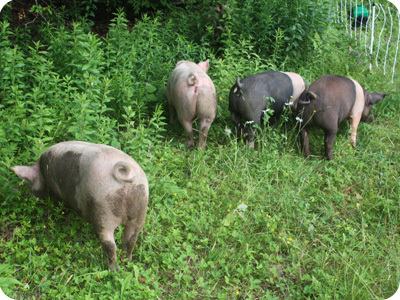 We deliver the pig to the butcher, and notify you when your pork is ready for pickup. Butcher fees are paid directly to the butcher when you pick up the meat. 5. We send you the balance due based on the butcher's hanging weight for the pig. Half pigs cost $4.25/lb hanging weight and whole pigs cost $3.75/lb. How Much Is a Whole or Half Pig?